I have an external hard drive that has worked fine for years. Now the hard drive won't show up in My Computer, though it shows up under Devices and Printers - very strange! I have tried initializing the disk from Disk Management, but it won't format and I keep getting 'The request could not be performed because of an I/O device error'. I have tried cleaning up the disk by deleting items but it shows 0 bytes free and keeps giving me 'The request could not be performed because of an I/O device error'. What can I do to make this work? " The device (hard drive) has developed bad sectors. Only certain files (in certain sections of the hard drive platter) will be affected. In this case, you can try and recover your hard drive data by copying as much of it as you can onto another hard drive. The logic board on the hard drive is bad. In this case it won't matter what you do - you will always get 'The request could not be performed because of an I/O device error'. You can send the hard drive in to the manufacturer to have the data reclaimed, however this will likely cost hundreds, if not a thousand dollars. It's cases like this which scream "You should have backed up your data!". It's also possible that your computer's USB is acting up, or the USB interface for the external hard drive is bad. In this case, you can try plugging the drive into another computer's USB port to see if you get the same result. If you don't, then you know the USB port on the other computer is causing you grief. If you still receive 'The request could not be performed because of an I/O device error' on the second computer, take the hard drive out of the USB case (if that is possible), and try plugging the drive directly to the motherboard (with power off, of course!). If you *still* receive 'The request could not be performed because of an I/O device error' - the drive is bad most likely for reason #1 or #2 above. If the drive is somewhat operational, you can do a few things to test it to see how badly damaged it is. This is done by testing for bad sectors, which essentially gives a map of the drive to show where corrupt data might be. If the drive map looks like swiss cheese (pic), then you are likely going to have a hard time recovering data - in that case, sending it in for data forensics may not be fruitful. Download Macrorit Disk Scanner (free) to the computer, install it, and run the program. Select the hard drive with 'The request could not be performed because of an I/O device error' from the pull down menu, the click "Start". The scanning process can take anywhere from 30 minutes to a day to complete, depending on how large the drive is and how badly damaged it is. At this point you can attempt to retrieve data off the drive, described next. It should be noted that retrieving data from a drive with 'The request could not be performed because of an I/O device error' can be difficult at best. This is because the drive will often freeze the entire operating system while it attempts to read (and re-read) corrupt data over and over ad infinitum. This can be very problematic if you have hundreds or thousands of files to copy over. Also important to note: if the drive you're having issues with is the C drive (which has MS Windows on it), this can cause even more issues because the operating system itself is likely corrupt, which will cause unbelievable delays when you try and do ANYTHING on the system. If this is the case I suggest you attach the problematic hard drive to another system either internally or externally and attempt to recover the data that way. Retrieving data itself can be done by the "copy" and "paste" technique for files and folders you wish to retrieve. If you have a lot of files to copy, I suggest you use something like TeraCopy as this will keep track of all the files it's copied over and also tell you how many more it needs to copy. This is much easier than using Windows File Copy. In all my years of computing (30+) I have come across maybe one or two drives that had the 'The request could not be performed because of an I/O device error' message and after formatting the drive, it worked fine. Usually when you get a 'The request could not be performed because of an I/O device error', the master file table or the file system will be corrupt. These errors can be fixed, so it is worth trying to format the drive if you don't care about retrieving the data. The reason the drive may have developed the error may have been a result of pulling the drive out of the USB socket prematurely, without safely ejecting the drive using the Windows interface. When you do this, read/write caches aren't purged and so you end up corrupting the drive. Click Start, type in "Disk Management"; wait for "Disk Management" or "diskmgmt" to appear, then click it. 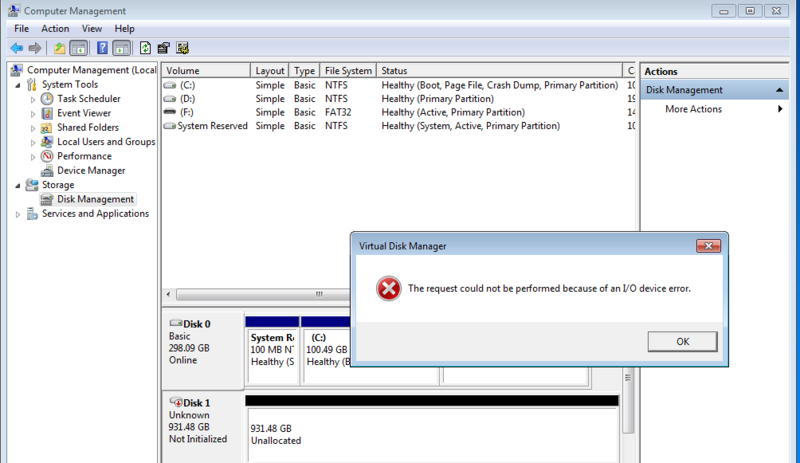 In Disk Management, left click the drive that is giving you 'The request could not be performed because of an I/O device error' to highlight it, then right click over top of the partition and select "Delete volume". Repeat the process for all volumes / partitions on the drive until the entire drive as unallocated space. Finally, right click the unallocated free space and select "New Simple Volume" to format it. 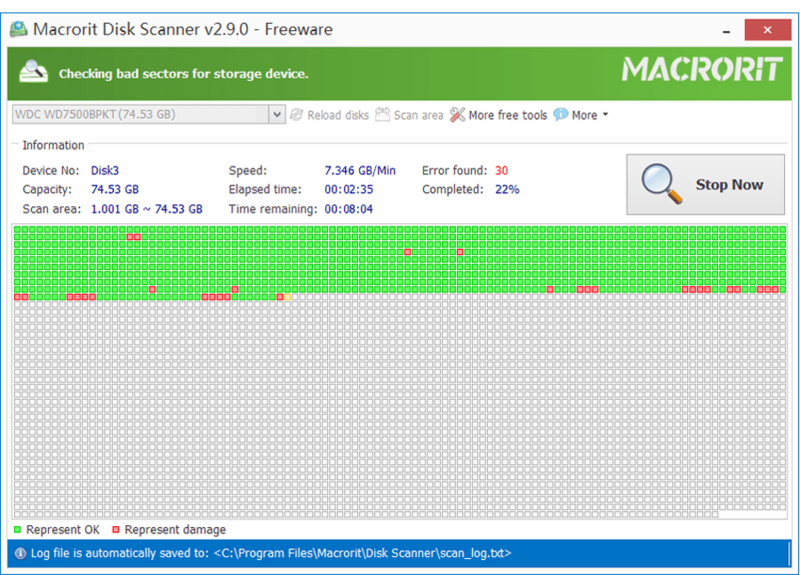 If Windows is able to successfully format the drive, you can use Macrorit Disk Scanner to scan for bad sectors to see how badly damaged the drive is. If you have even 1 bad sector I would not use the drive because this means the drive is failing and you will still encounter the 'The request could not be performed because of an I/O device error' when the drive gets close to that sector. If all of this is over your head, or if you need help retrieving data off a drive with 'The request could not be performed because of an I/O device error', I can help using my remote desktop support service. Simply contact me, briefly describing the issue and I will get back to you as soon as possible. Got a Computer Question or Problem? Ask Dennis! I need more computer questions. If you have a computer question -- or even a computer problem that needs fixing -- please email me with your question so that I can write more articles like this one. I can't promise I'll respond to all the messages I receive (depending on the volume), but I'll do my best. About the author: Dennis Faas is the owner and operator of Infopackets.com. With over 30 years of computing experience, Dennis' areas of expertise are a broad range and include PC hardware, Microsoft Windows, Linux, network administration, and virtualization. Dennis holds a Bachelors degree in Computer Science (1999) and has authored 6 books on the topics of MS Windows and PC Security. If you like the advice you received on this page, please up-vote / Like this page and share it with friends. For technical support inquiries, Dennis can be reached via Live chat online this site using the Zopim Chat service (currently located at the bottom left of the screen); optionally, you can contact Dennis through the website contact form. It may be worth trying to run Steve Gibson's excellent SpinRite program on the drive. It's available at grc.com. Disclaimer: no financial relationship with Steve, just an admirer of his awesome software.